CHIEFTAINCY may mean several things to many people. Some of us may not want to dabble in the long debate about the institution, except to declare that we are traditionalists, and we respect the traditions that have helped to bring us together as a people. It is a contentious issue; evokes tension; and it can be argued either way….. (or many ways). EXCEPT – to say that the recent gesture by Otumfuo Osei Tutu II visiting his brother, the Okyenhene, at Kyebi, and celebrating the 75th anniversary of the passing of Nana Sir Ofori Atta I; paying a royal visit to the Jubilee House; and calling on ex-President, Jerry John Rawlings, are as remarkable a gesture as they are refreshing. For some people, there should constantly be a conflict, a battle, a war within the society. Other people seek peace, and will always demonstrate their love for it in several ways. Nana Osei Tutu II, the Asantehene, has shown the way. A discussion of chieftaincy is like a discussion of the Buddhist and Hindu parable of ‘the Six blind men and an Elephant’. The blind men, out of curiousity decided: “We must inspect and know (the elephant) by touch, of which we are capable”. The blind men judged an elephant variously by which part of the animal each touched: one, touching the trunk, said the elephant was like a big snake: the one whose hand touched the ear said, the elephant was like a fan; the third person touching the leg said the elephant was like a tree trunk; touching its side, the fourth blind man said an elephant was like a wall; another who felt the tail said the elephant was like a rope; the last person who felt the tusk thought an elephant was a hard smooth animal, like a spear. Philosophically, one can see a wide range of truths and fallacies. The “Rigveda”, said to have been composed between 1500 and 1200 BCE notes: “Reality is one, though wise men speak of it variously”. Buddha, using the same analogy, cries out; “O how they cling and wrangle, some who claim for preacher and monk the honoured name! For, quarreling, each to his view they cling, such folk see only one side of the thing”. At the durbar at Kyebi, the cloth worn by Otumfuo symbolized ‘unity’, similar to the one that Nana Sir Osei Agyemang-Prempeh II wore in 1935, after being crowned Asantehene when his predecessor , Nana Osei Agyemang I went to his village in 1931. Culture was on display. The over-2000 delegation from Asante had much to offer. 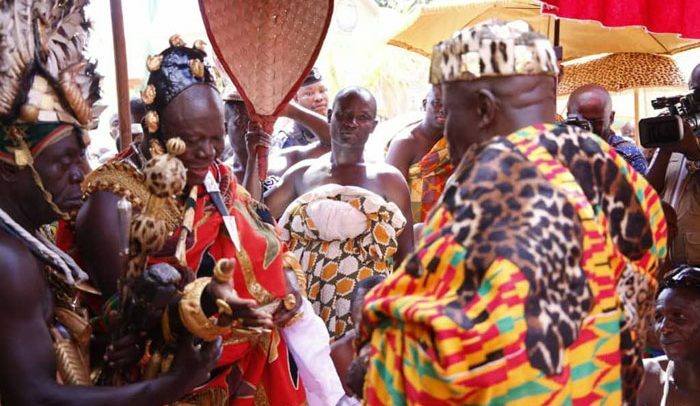 The warm embrace of Asantehene and Okyenhene climaxed the event, and watchers only saw the regal relationship, and not the conjugal one between Asante and Akyem. Adanse, the original home of the Akyems had been a source of the legendary spousal choices of Asante Chiefs, and Otumfuo Osei Tutu II had his lover hailing from Akyem. Otumfuo Osei Tutu II could not forget the effective advocacy role played by Nana Sir Ofori Atta I in getting Nana Osei Agyeman Prempeh I to return to Kumasi from exile in the Seychelles. At the Jubilee House, President Nana Addo wished that the demonstration of unity and solidarity by the Asantehene and Okyenhene could be replicated across the country. The President noted: “The lesson that was given in Kyebi is a lesson that should be taken across Ghana about the need for unity among our people…. of diverse origins, history and culture, but essentially we are part and parcel of the Ghanaian family, and that is what we need to hold on to, to maintain the unity, coherence and stability of our nation”. President Nana Addo recalled that since 1999, the Asantehene had visited every President of the Fourth Republic, however, that was “the first time that we have seen such a powerful delegation of Asanteman here at Jubilee House”. The President used the occasion to laud the Asantehene for his role in reducing tension and smoothening things over. Otumfuo’s visit to the Jubilee House was, in his words, to find out how the President was faring and to show that he was praying for him. To the Ministers, Otumfuo urged them to work hard to ensure that after four years, the government would be able to render a good account. The government appointees must not hanker after money, but rather seek truth and honesty, he noted. We cannot forget the fact that Nana Addo had been Otumfuo’s lawyer in the past! Otumfuo decided to pay a visit to the Rawlingses at their Ridge residence, after his august visit to Kyebi and the call on the President at Jubilee House. The entourage of Otumfuo was very well received. Ex-President Rawlings admired the atmosphere of unity as displayed by the Otumfuo and the Okyenhene. The act was inspirational, and it was a great motivation for national peace and cohesion. The former First Lady, Nana Konadu Agyeman Rawlings admired the addresses delivered by the Otumfuo and the Okyenhene. She noted that the speeches were “inspiring” and “passionate, they would, definitely, arouse a sense of patriotism and nationalism. Otumfuo and Okyenhene had displayed a great showing of statesmanship. Those whose interests are parochial and not nationalistic had a lot to learn from this display of unity, the Rawlingses family noted. Political watchers are enthused about Otumfuo’s approach towards peace in Ghana; he had demonstrated his love for peace and unity on several occasions, and he had not relaxed his efforts to ensure peace at all levels in Ghana. It is significant that the drafters of the 1992 Constitution put in a clause that guarantees the chieftaincy institution, Article 270 states: The institution of chieftaincy together with its traditional councils as established by customary law and usage is… guaranteed”. The Chieftaincy Act of 2008 (Act 759) is there to guide Chiefs on their role in national development and progress. Let us hope Chiefs everywhere in Ghana will pick a cue from the example set by the rulers of Asante and Akyem, and help to make Ghana a peaceful nation.